Qobuz hi-res streaming now live on Android | What Hi-Fi? Qobuz has released updates for its Android and iOS apps, becoming the first service to bring high-resolution audio streaming to smartphones. If you're on Android and a Qobuz Sublime subscriber, then from today you will be able to stream 24-bit hi-res tracks on Android devices, thanks to an update to the Qobuz Android app. There are also design tweaks and some minor bug fixes. Also new today is an update to the Qobuz iOS app, which brings your downloaded and streaming files into the same Qobuz app on Apple devices. Qobuz Sublime provides in excess of 28 million CD-quality files, but subscribers can also access 24-bit downloads - and benefit from a 60 per cent discount. Hi-res streaming will only work on compatible Android smartphones, such as the Sony Xperia Z3, Samsung S6 range and LG G4. Qobuz has already announced that it will be the first streaming service to have a dedicated app on the Apple Watch. The news comes after the recent announcement that Spotify is to launch an app for Android Wear smartwatches. Qobuz recently became available on Linn DS network music players too, from Kiko to Klimax, with users being able to listen to music via the Kazoo application. 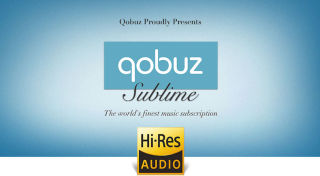 Linn has confirmed it’s working on bringing support for Qobuz Sublime to its products. Norwegian audio brand Electrocompaniet also announced it will be integrating Qobuz hi-res streaming into its ECM 2 network media player.